What happens in Vegas definitely doesn’t stay in Vegas when it comes to T-Mobile. The company’s announcements and Legere’s AT&T party crashing have been the talk of the web for the past 7 days. Today, New York Times published an interview with T-Mobile executives, John Legere, Mike Sievert and and Braxton Carter, in which the execs discussed the questions we all want to know answers to. Will Sprint buy T-Mobile? What did getting thrown out of AT&T’s party feel like? What do you think of AT&T’s responses in the market place? 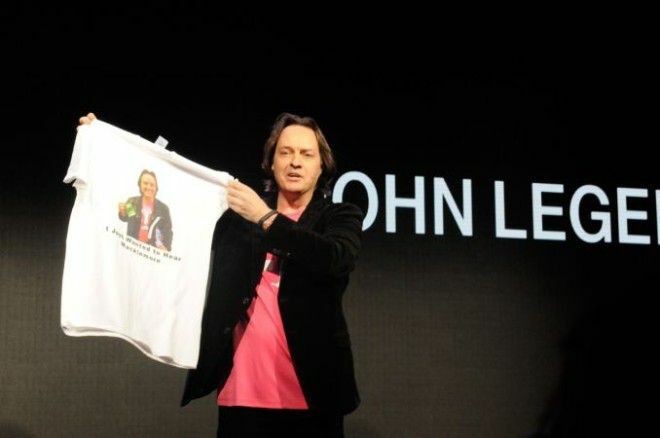 Many industry watchers believed (some still do), that John Legere’s attendance at an AT&T party at CES was a publicity stunt. It wasn’t, but it certainly turned the spotlight on to T-Mobile. In answer to what it was like getting thrown out, Legere stated it was “Surreal”. Turns out, he had passes to attend the party, he really wanted to see Macklemore performing. After double-checking with the guards that AT&T’s chief really wanted him out, they got the nod. Apparently he was “trespassing”, despite having an official pass. “We envision a better industry where if you’re not happy with where you are, you can just move to another carrier. We’re willing to take that risk, we’re passionate about being the best and we know people will stay. It’s a different philosophy. We can translate that two ways. Either a) A buyout is going ahead, but T-Mobile will continue with its philosophy and focus on changing the wireless industry, or b) A buyout isn’t happening. It did get me thinking, surely if T-Mobile has recently become a company that’s viewed as an attractive proposition, it’s because of its moves in the market. It’s because of all the steps of the Uncarrier push. No company buying Tmo would get rid of that, surely? Despite the vast gap in subscriber numbers, T-Mobile’s challenge is almost always directly aimed at AT&T. A lot of that is because the company keeps on taking the bait whenever Legere takes aim at its practices. This back and forth is set to continue and hopefully make 2014 as interesting as 2013 was. In fact, I have to say, last year was the first year that the U.S. carrier scene didn’t bore me to tears. What I find interesting is people really believe that AT&T hasn’t started fighting yet. They’re in full fight mode. You go fromNext, you go to zero down payments, you go to what they did over the holidays — they changed their dress attire in the stores. And then they came out with a plan to try to throw cash at people. That’s as good as it gets and it’s not working. I’ve only picked up the highlights from the interview here. The short interview is well worth reading in full. Head on over to NYT to read it all. T-Mobile is still not that large in terms of their subscriber base. I honestly don’t think the Justice Department would object to a T-Mobile/Sprint merger…there are still other companies to go to. That’s another thing with the DOJ & FCC. If and only if they approve the merge, it will create a new company with around 90 million customers. On the other hand, the “Big Three” will control nearly 90% of all customers. In this situation, it will look exactly like what happened to Canada. I don’t think the issues the DOJ had with AT&T buying TMO (EIEIO) had as much to do with them wanting 4 carriers for competition as much as wanting to not have 2 companies controlling almost all of the market with only a single weak company to compete with them. Also it would have reduced the U.S. market to a single GSM based company. With Sprint & T-Mobile you’d have 3 companies yes but the third one would be much bigger and stronger and be more viewed as a real competitor for VZW & AT&T. Depending on what they do with the networks then it could leave 1 company controlling the majority of CDMA or GSM. If they shut down T-Mobile then it’s all AT&T for GSM. Shut down Sprint and Verizon is kind of CDMA. Will they want to do another Nextel and have two different networks? It will take years to shut down one network given the size of either company. MetroPCS was a small company which made it easier to convert their CDMA over to T-Mobile. The company is using the spectrum already but have any original MetroPCS CDMA markets been deactivated? There are probably customers still using original Metro handsets that won’t pick up T-Mobiles signal. They said anything that is going to change their philosophy is not going to happen. And how do we know T-Mobile won’t put in a buyout failure clause? If I were T-Mobile, I’d want to amuse this possibility. T-Mobile is firm about what they will consider and they don’t want anything to change. Not sure where your pessimism comes from at this point. You are so paranoid and change-averse it’s alarming. Just relax. Nothing is confirmed. If you’re this nervous, switch preemptively. Maybe it’s a reverse buyout? SoftBank, Sprint is very toxic. They are losing subscribers and with the new Framily plan, it is generating less revenue per user than T-Mobile. Hopefully TMUS will do something similar to UK division’s EE and share network and spectrum instead. I hope they stay away from Sprint like the plague. That yellow nightmare has nothing to offer T-Mobile. NOTHING. Problem is, it’s not about that Sprint has to offer T-Mobile, but what T-Mobile can offer Sprint…which is an existing customer base. Don’t forget faster data and better coverage in some areas. I beg to differ. I do agree it’s important to have subscribers, but just buying a company for the subscribers opens up large amounts of churn. What’s important in today’s industry, and worth buying another company over, is the spectrum; even their movement and capabilities. T-Mobile may not have as much spectrum as Sprint, but T-Mobile sure knows how to deploy what they do have. They’re very strategic and progressive, whereas Sprint isn’t. That’s what Sprint needs and I don’t blame SoftBank for wanting that in the U.S. I don’t want the Spring buyout to happen. I know that if given a year and half (more than likely even less) T-Mobile will overtake Sprint. SoftBank probably knows they wanted a company more like T-Mobile rather than Sprint and are trying all they can to make that happen. Sprint barely has more spectrum than T-Mobile – and most of it is not super useful(the 2600 mhz band only has functionality to supplement overloaded LTE sites in metro areas – something that the PCS band would have eventually been able to do when CDMA is gone/replaced). What T-Mobile has over Sprint is that the spectrum they do have they’ve been able tenfold more efficient with. A company of Sprint’s size has run out of understandable excuses as to why their LTE network is A)Not built out fast enough and B) Not deep in bandwidth. It’s been nine years worth of bad moves for them(not shutting down nextel towers immediately, not picking LTE when everyone else was, not hiring competent customer service reps who could be straight with customers), Absolutely no one should feel sorry for the position they put themselves in. John Legere summed their situation up very well “They’re a pile of spectrum waiting to be turned into a capability.” That’s not good enough for any consumer, why should it be? BUT I am not sweating any buyout. Even if the buyout occurred (and I don’t think it will), then T-Mobile would probably run as its own company. I would be surprised if a combined Sprint/T-Mobile would even try to force T-Mobile users to CDMA. I think if anything the opposite would be true. Sprint would look at TMOs existing GSM network as a way to get Sprint customers off of CDMA. Even Verizon is stepping further away from CDMA, once they have VoLTE nailed down you will see Verizon phones coming out without CDMA radios. AT&T would be able to charge international carriers any price they wanted for roaming and corner the market otherwise. With the network in its present state, I don’t even want their subscriber base. Sprint’s bogged-down network could very easily become T-Mobile’s problem. I don’t think the Justice Department would have many concerns with a Sprint/T-Mobile merger (considering the sell offs of spectrum in areas to make it happen). What I DO think they will have a problem with, is a foreign company buying up two U.S. telecommunications carriers. That’s the issue I feel. If/when it comes down to it, I think SoftBank owning Sprint is the biggest roadblock for a buyout of T-Mobile. If it was just Sprint and T-Mobile with no outside interference, I don’t think it would be a large issue. I could be wrong about this, but as it is – I don’t think this will be allowed to happen. And best of all T-Mobile has set their foundation and won’t give up the things that are making them prosper now. Actually, TMUS’s parent company is 32% owned by German government. I’m sure that DOJ will more than happy to have only one foreign company owned teleco in the US than two. New FCC Chairman wants 4, the US has always wanted 4, Congress wants four. Let Son be as delusional as he wants – I highly doubt that merger would survive the legal process. honestly, with so many smaller carriers still existing 4 still makes plenty of sense. When the landscape no longer has US Cellular, C-Spire, etc, then maybe they should have that discussion. There are still acquisitions to be had that can make a big difference in both coverage and customer count without getting national players involved in being sold. It’s not that the government would have a problem with the amount of customers the combination would have, but there wouldn’t be a smaller national player to put pressure on Verizon and AT&T – the new T-Mobile/Sprint could get away with getting rid of unlimited data and also charging almost as much as both the top carriers because they no longer have to contend with each other for the lower end scale of postpaid. That would be EXTREMELY dangerous for existing customers. Sprint is foreign owned. What if Softbank buys T-Mobile US and rolls Sprint into T-Mobile US instead of the other way around? If, a buy out is indeed in the works, and approved I’d rather have that, be the case. It will never happen. The Germans would NOT consent to letting the Japanese gallivant around in magenta and using the “T-” name. No way. I can guarantee the combined company would be Sprint, through and through. So what is in a name? I agree the T-Mobile US brand would be gone and the brand going forward would be either Sprint or some re-branded entity. The real merger would be which company systems, culture, management and employees are in charge of the combined company. Besides – I see this option as the only way regulators would let it go forward. They want to preserve the industry competitive environment. T-Mobile’s plans are obviously working better than Sprint’s. If Softbank purchased T-Mobile they would bring them under one Umbrella corporation called T-Virus. That would be interesting and far more appealing but for many people who read the information on this site it would come down to the details. Who would run the company, which network stays and which goes, which networks price plans will remain, who’s job out of the thousands of employee’s would remain, etc. Softbank will pick up huge amounts of debt and will need to see money coming in to start paying that back. They would probably end up spending more after the deal to figure out what is needed to combine the networks and then make it happen. They are also investing heavy to fix Sprints network and to shut that one down would be throwing money out the window. T-Mobile has a great network in place and it would be foolish to toss that out and stop it’s expansion. It is the details that would make or break the deal for fans of T-Mobile. Share holders want the $$ that would be involved and the subscribers are a distant afterthought, if thought of at all. Speaking of foreign owned.. Will the U.S Government actually let a Japanese Company hold major stakes in TWO of the top 4 largest wireless carriers in the United States?.. yeah right! haha. If announced, this acquisition would be dead from the start. No, I don’t think they’d be able to operate them seperately. If Softbank wanted to buy and operate T-Mobile US they’d be forced to divest Sprint. (The same thing almost happened in 2004 when Vodafone was bidding for AT&T Wireless, they would have had to sell their stake in Verizon even though they were a minority holder). Ha, interesting if this were to happen and it be a means to cut their loses with Sprint. I’d hope they knew the full condition of Sprint’s network and company when considering their purchase. Softbank definitely know the condition of Sprint! And they know that Sprint’s reputation is so bad that there is absolutely no way to repair. Since Softbank is a Japanese company and some older Americans (just some, not generalizing) do not like foreigners… So during this transition period, I do not think Softbank will consider any rebranding and M&A in 2014. Besides, TMUS is 73.46% owned by DT. A German government controlled company. That’s actually an interesting take on this. So maybe I’m an idiot here… but I’ve been poking around and haven’t been able to find an answer. When are the TMoNews forums going to work again? I mean they have to know they’re broken right? They’ve been down a long time and I can’t find anything that says anything about it. In all honesty, I’ve been against Sprint merging with T-Mobile since day one, that being said if T-Mobile is still the brand that is sold and they keep the same infrastructure and such I wouldn’t be all against it mainly because Sprint owns more spectrum than any other carrier, if T-Mobile were able to get that they could seriously start setting up an even better network for their LTE. Sprint also has 800mhz that could be used to help with rural areas and building penetration something T-Mobile desperately needs. That’s the only way I’d be okay with this whole thing, if anything other than that happens I may end up bailing, I guess we’ll have to wait and see. Don’t let the short-term attractiveness of a T-Sprint outweigh the inevitable long-term setbacks. Sprint is synonymous with slow, uncaring, and lousy. They’ve been poorly managed for many years now, and survived nearly exclusively because of an aloof/imprisoned subscriber base. And if you think T-Mobile has image problems, you’ve obviously never heard of Sprint. We don’t want that for T-Mobile, too. There are pros and cons about Sprint’s Network Vision. The good part is that they put multi-band into one cellular tower, which will reduce the cost to operate dramatically and allows more traffic with the Spark project. However, if the distance between the towers are too far apart, most likely the 800mhz band will survive over the long distance. Beside, TDD is nice and able to handle tons of subscribers, but FDD is the only way to provide reliable service. You said aloof/imprisoned subscriber base. Lol I have to agree. I have a buddy that just switched from sprint to T – mobile. Nothing but a bad experience from day one. (He kept renewing his contract though) He always made excuses for them suckers, aww it’s getting better is all I use to hear from this guy (not really). We would talk several times throughout the dau, nothing but dropped calls. Oh believe me I’ve heard of Sprint which is why I’m 90% against the whole thing haha. I came to T-Mobile from Sprint about 5 months ago and I hated pretty much every minute of being with them. Since being with T-Mobile, though they still have some issues to fix, I’m a very happy customer, when I have my LTE it’s super fast, my 4G is really good too, but when I go to my friends house on the weekends the coverage suffers immensely as I have a hard time getting one bar of EDGE at his house, usually dropping to No Service, which isn’t helping me sway him to switch to T-Mobile from Sprint, but I think he’s gonna do it cause he’s so fed up with Sprint. Again the only reason I’d be ok with the merger is because of the spectrum and that’s literally it, if any of the Sprint people remained in charge I’d still want to leave, they’re horrible and I don’t want them messing up all the great work T-Mobile has done. I was hopeful when I was with Sprint that they would get their network up and running but wow they failed BIG TIME, they announced my city back in January 2013 for LTE to arrive in the coming months and here we are January 2014 and they have some LTE up but hardly enough to do anything with, truly pathetic. I laughed when I’d heard T-Mobile got their LTE out where I live only about 4 or 5 months after starting LTE and I decided to join the mobile revolution. T-Mobile for the win! Honestly Cam I think I can see the big 3 pushing for Sprint to buy out T-Mobile in hopes of stopping their attempts at changing the industry. No matter what Legere and Co say, they won’t be able to do anything if Deutsch Telecom sells. Which is exactly why I DON’T want Sprint’s hands on T-Mobile. If we must merge, let it be Dish. They are as despised by their competitors in the TV space as T-Mobile is in wireless. What about no merge at all? What if DT decide to spun-off TMUS instead? TMUS is probably the largest network of the whole T-Mobile International AG. DT owns 73.46% of TMUS, and has a 18-mo lockup period until Nov 2014. If DT really want to sell the whole division to Sprint and Dish, it will takes another 18-24 months to gain approval from FCC and DoJ. However, if DT spun-off the US division and license the brand instead, it will be more effective and way faster to unload assets. TMUS already is a separate entity. DT is just a majority shareholder of TMUS… The FCC already balked at the AT&T merger, and TMUS was a weaker entity in the industry then. There would be NO WAY I could logically see them letting them be eaten up now that they are literally changing the industry as we knew it to be. After the 600 Mhz auction what is next? Will there be more auctions for low band spectrum? It would take YEARS for a merger between T-Mobile/Sprint. Imagine nearly 40M customers having to move off the network while Sprint ramps up its network. Look at how long MetroPCS is taking to shutdown. NOTHING good will come out of a merger. The new company will a third place loser. FCC needs to impose caps on spectrum auctions. That’s it, the rest will sort itself out. they bought metropcs six months ago and that network will be completely shut down in about 2 years, how is that long? It took Sprint 8 years to shut down Nextel. Moving 10 million customers isn’t as easy a feat as you make it sound. Imagine this…. Tmobile starts to generate so much revenue, their parent company buys sprint from softbank. I say this because by the time sprint is done, it will be too late. Theyre already on track to be the 4th carrier…. Also when verizon starts tearing down their cdma network, which sprint relies on for a huge chunk of their coverage outside of towns and cities, their coverage map will simply make people say no. It will take a while for Verizon to tear down its CDMA network. 2021, remember? According to John, TMUS added 4.4 million subscribers in 2013. So the total subscribers are in 2013 is 49.439 millions compare to Sprint’s Q3 54.877 millions. If the Sprint to T-Mobile porting ratio continues above 3:1, and Uncarrier 4.0 made a big impact in the industry, by the end of 2014, T-Mobile will definitely become #3 carrier. You didn’t read what I said. He made an incorrect estimate that t-mobile now had 49.4m customers because of 4.4m adds, I corrected him by saying that 4.4m was for the _year_ and that they only added 1.6m for the _quarter_, hence the 46.6~ish figure. Oh. Lol my bad its a lot of words in there. That’s an other issues with Apple. In the Jobs era, Apple was very strict about the phone spec and model they made. But in the post Jobs era, Apple loosen that restriction and begin to make models for nearly every carrier of the world. 4 different models for iPhone 5S/C and 3 for iPhone 5. I know this is the Internet, but if you’re going to make a long comment, please use periods. I kinda like breathing. Yes and no. Remember that Verizon planned to shutdown the CDMA network by 2021? If Verizon start its VoLTE as planned in 2014, most likely it will stop selling CDMA phone. It happened to MetroPCS! If that piece of $#!& Sprint buys T-Mobile I’ll try to be the first to leave T-Mobile after being with them for 7 years. Sprint has the CRAPPIEST customer service habits and quality on the planet. They hire the least intelligent people with the lowest form of common sense. Sprint buys…I’m going back to Verizon. No questions asked. As much as I hate giving them my money, I would go back to AT&T if Sprint bought T-Mobile. Sprint is the absolute worst. The only way I would remain with a merged Sprint/T-Mobile is if the new combined company made the T-Mobile plans/brand their new brand and dropped everything associated with the old Sprint. Including migrating Sprint customers over to GSM and decommissioning the archaic CDMA network. I won’t ever use a CDMA carrier again. drop T-mobile. This. Had. Not. Changed. A Buyout will deffanatly put the breaks on the Uncarrier motion. T-mobile will fail. They haven’t changed their core business. Buyout won’t happen. Sprint won’t even make the offer because FCC will drag it (until after 600mhz auction) before seeing who wins what spectrum. Is anyone in Cincinnati Ohio experiencing an outage?? Not sure if they are working on LTE there yet. I didn’t have an outage but my data speeds were painfully slow (even for Cincinnati) until this morning…and I dropped to edge once or twice. Do you usually get HSPA+ where you got EDGE? Maybe they are working on something? I just saw there was an outage on Drop Detector after someone posted a picture on instagram. Yea It just dropped down to edge for 5 mins then it came back. Did it twice that day…. They might be finally working on LTE for you guys. Doubtful – there’s no spectrum to launch LTE with yet, unless they use like a 3 mhz channel instead of 5×5. according to the map, cincinnati is experiencing some sort of outage. To bad Mike Sievert isn’t the controlling interest in T-Mobile USA. Unless Deutsche Telekom feels the same way it doesn’t matter what he says. Lucky for us T-Mobile fans it would be hard for any company to jump ship with the gains T-Mobile is making lately.